Look center Strip and you´ll find a complete Las Vegas experience in the shining, yet not overwhelming, Harrah´s Hotel and Casino. 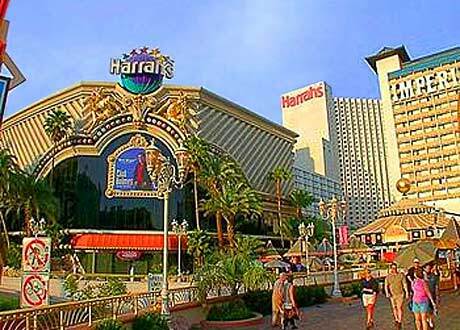 While not among the largest nor most famous Strip properties, Harrah´s Hotel and Casino offers a consistent full-service Las Vegas experience in a smaller, more approachable atmosphere where both the staff and the prices are friendly. Superbly located, the first thing one might notice about Harrah´s Hotel and Casino is the ease of getting there. Just steps from the sidewalk, you can just walk on in from the Strip without having to travel half a mile to the front door, as is required at so many other properties. Harrah´s Hotel and Casino also boasts another entrance - it´s one of the official stops of the Las Vegas monorail - and brings you toward the back entrance of the casino. Once inside, the brazilian theme permeates the atmosphere. The colors, décor and music serve to create a south american inspired party. The gamer gets all of the expected selection right there in the casino - which is sized well enough to never get lost in, yet large enough to miss nothing. Slots (paying up to 98% return and featuring familiar and new machines), poker ( 10 tables offering Texas Hold´em, seven card stud and Omaha), Keno, a race and sportsbook and table games (80 tables to test your skill and luck, including baccarat, mini baccarat, blackjack, craps, roulette and Let it Ride). The high roller seeks out the high limit slot room - conveniently located near the casino´s center - offering machines that accept up to $500. Complimentary membership is available to players in Total Rewards, Harrah´s players reward program. The program combines your Harrah´s Hotel and Casino play with that of five other Las Vegas casinos and nearly 40 casinos nationwide. COnsisting of four levels: Gold, Platinum, Diamond and Seven Star, the benefits and perks accelerate at each level including meals, rooms, merchandise, shows rounds of golf and special packages created just for high rollers. Since all the action can make any player hungry, Harrah´s Hotel and Casino offers an assortment of restaurants with every taste and budget in mind. For those who prefer a causal setting, the ever open Café at Harrah´s which is located right off the casino floor, serves breakfest, lunch and dinner. Features include salads, sandwiches, burgers, pizzas, pasta, steaks and All Days specials that will hit the spot in a setting that doesn´t resemble a diner. For lunch or dinner, the lively Toby Keith´s I Love This Bar and Grill highlights barbeque with a southern flair in a rousing county music-infused joint that will keep your toes tapping as you watch the game on the big screen TV that is highly visible from virtually every part of the restaurant. Ribs, steaks, fowl and fish are served with traditional home-cookin´side dishes on colossal platters assuring no one leaves hungry. It´s said that Toby keith himself pops in on occasion. Of course, no casino is complete without a buffet and the Harrah´s Flavors Buffet offers live cooking stations, prime rib, crab legs and, of course, Brazilian BBQ within the look and appealing , spacious restaurant. The buffet is open from 7:00am until 10:00pm daily. If a more upscale dining experience is what you seek, Harrah´s Hotel and Casino is there to please. The Range Steakhouse presents you with an intimate setting and grilled-to-order steaks, prime, rib, seafood and poultry with a first-class view of the Las Vegas Strip. Dinner is complemented by live entertainment on friday and saturday nights. Should more exotic fare be your pleasure, Ming´s Table features gourmet Chinese cuisine in a distinctly Asian dining room. Unique prepared, entrees range from traditional dishes such as roast duck with plum sauce and the perennial favorite, spicy kung pao shrimp to the more modern dan-dan noodles and honey glazed walnut shrimp. Penazzi Italian Ristorante serves classical Italian cuisine expertly prepared with a contemporary flair. Traditional pastas and sauces abound, accompanied by succulent meat and seafood garnished with fresh vegetable creations. The Oyster Bar at Penazzi features both cocktails and flavourful, creative seefood selections for the intrepid patate. Unique to Harrah´s Hotel and Casino, partiers can dance the night away in Carnaval Court, an outdoor nightclub which rocks from 5:00pm until 2:00am nightly. You may hear it before you see it - the appealing music ranges from pop to jazz to oldies beach music and dancing is encouraged ! Void of stuffy dress codes, you can enjoy casual dinning while experiencing the show of the finest flair bartenders in the country. The number one male and number one female flair bartenders in the country were recruited by Harrah´s Hotel and Casino to entertain you with their skill and pizzazz. Weekends bring the addition of live blackjack. The nightclub is surrounded by Carnaval Court´s shops and kiosks offering an array of unique souvenirs and snacks. The 2500 rooms at Harrah´s Hotel and Casino are known for being well-equipped and larger than average. Newly-renovated, the rooms feature movies and games, a mini-bar, internet access, room service, blackout draperies, non-smoking floors and everything else you would expect in a center Strip hotel plus one thing you wouldn´t - room rates begining at just $44. 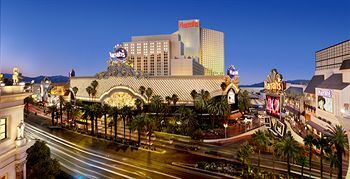 Harrah´s Hotel and Casino also offers Stay and Play packages and suites for special occasion. While it doesn´t have waterfalls, waves or an attached beach, the pool at Harrah´s Hotel and Casino is an Olympic sized outdoor facility serviceable for both the lap and recreational swimmer. You will find confortable chaise lounges with attached, adjustable sun hoods, private cabanas and a poolside snack and drink bar with an ample and varied selections. The attractive pool area is in its own courtyard surrounded by the high walls of the hotel which should keep most of the direct sun away. The SPA and gym are attached but separate entities at Harrah´s Hotel and Casino. The gym has basic cardio machines, free weights and Life Fitness circuit machines. It´s a smaller-sized facility without extravagance but seems to have the expected bases covered. Both men´s and women´s locker rooms contain sauna, Jacuzzi and steam rooms. Harrah´s Hotel and Casino attached SPA offers an impressive and complete menu of services. You´ll find an array of massages (sweedishm deep tissue and stone among the choices), body treatments (body glows and wraps) and facials with various options available. Salon services feature full service hair, nail, waxing and make up options. Prices are in line with better spas and salons, and include admission to the gym with any service. Harrah´s Hotel and Casino, located center Strip just north of Flamingo Avenue offers its guests a convenient and well priced complete Las Vegas experience. While it may not have the wow factor of the larger and more expensive properties, Harrah´s Hotel and Casino misses nothing and makes up for it with hospitable and service-oriented employees, good selection and quality restaurants, above average rooms, world class entertainment and, of course, a can´t be improved location.